Pork shoulder is my favorite cut of meat. It is a hard working set of muscles, full of tough and chewy tendons, and should not be cooked medium-rare. Those tendons start to melt into gelatin at 160°F…but don’t stop there. By the time the roast is cooked to 195°F, it is full of tender and juicy gelatin, and ready to shred with a fork. This recipe uses a basic wet brine - just water, salt and sugar. Wet brining works better with pork than dry brining. I’m not sure why. Other meats seem to get watered down by the brine; pork tastes…porkier. Is porkier a word? No? Oh well, you know what I mean. Don’t be fooled by the simplicity of this recipe. That hard working pork shoulder has a lot of flavor, and a simple brine builds on it to make a roast that is better than the sum of its ingredients. 1. Brine the pork: Stir the brine ingredients in a large food safe container until the salt and sugar dissolve. Submerge the pork in the brine. Cover and store in the refrigerator for four to eight hours. 2. 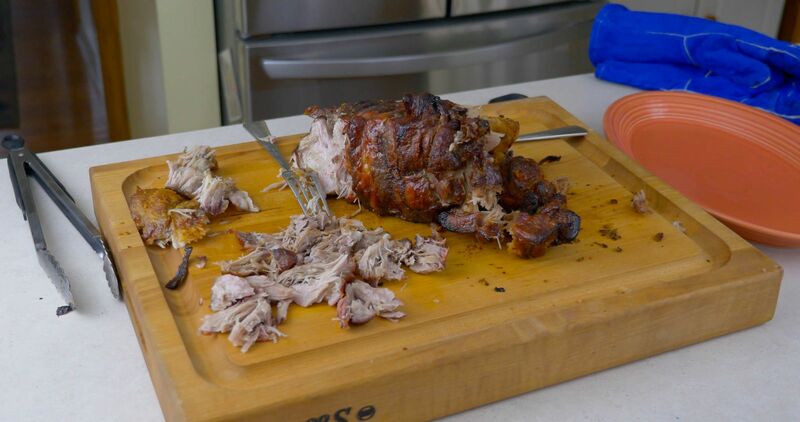 Truss and spit the pork: Before heating the grill, remove the pork from the brine and pat dry with paper towels. Truss the pork roast, tying it every 1 1/2 inches. Skewer the trussed roast on the rotisserie spit, securing it with the spit forks. Let the pork rest at room temperature until it is time to grill. Submerge the smoking wood in water and let it soak until the grill is ready. 4. Set up the grill for indirect medium heat: Set the grill up for indirect medium heat (350-450F). Place wih a drip pan in the middle of the grill on top of the cooking grates to catch the drippings from the roast. 5. Rotisserie cook the pork: Put the spit on the grill, start the motor spinning, and make sure the drip pan is centered beneath the pork roast. Add the smoking wood to the fire, close the lid, and cook until the pork reaches 195° to 205°F in its thickest part, 1 1/2 to 2 hours depending on the thickness of the roast. 5. 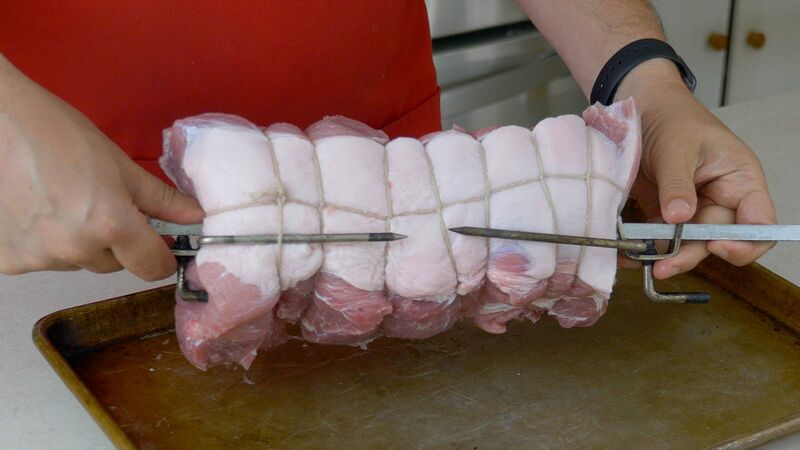 Serve: Remove the pork from the rotisserie spit and remove the twine trussing the roast. Be careful - the spit and forks are blazing hot. Let the pork rest for 15 minutes, then slice and serve.